Ontario Fishing Directory - Lures and Tours Blog: Buckhorn: Food Network TV Star - Stephen Childs Needs Your Vote! Buckhorn: Food Network TV Star - Stephen Childs Needs Your Vote! Scotsman Point Resort, Buckhorn Ontario Nurtures Food Network TV Star! Scotsman Point Resort, Buckhorn, Ontario Stephen Childs, creation: Chipotle Chili Slams competes online December 5 -7 as one of seven Presidents Choice newest products at www.recipetoriches.ca Stephen Childs, who grew up in Buckhorn, ON, at his family's small business, Scotsman Point Resort, never thought he would find himself on national television. Food and cooking have been a central part of Stephen's life. He is excited to share the values of good healthy food and eating together with my wife Jen as they raise their 16 month old daughter Della in Victoria BC. Stephen believes access to quality food and nutrition is essential to building our communities. Should he be fortunate to win the grand prize, he has made a commitment to financially support food based initiatives across Canada. Chipotle Chili Slams - Top New President's Choice Product? You Decide! 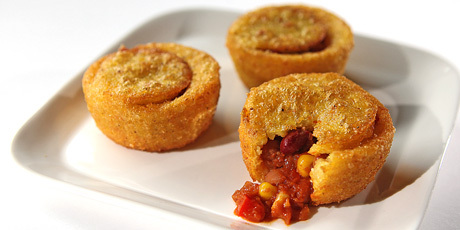 Chipotle Chili Slams - a President's Choice product available in stores across Canada, are a savoury snack delight which incorporates chili in its own self-contained cornmeal bowl - sure fire winner for taste and convenience! You can help Stephen's Chipotle Chili Slams be recognized as the top recipe by spreading the word using the social sharing buttons below, then voting online. Visit Scotsman Point Resort, Buckhorn, Ontario LuresAndTours Webpage for more information about this remarkable family business!